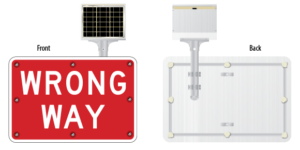 Wrong Way Warning System | Garden State Highway Products, Inc.
Wrong way warning is an advanced driver-assistance system to prevent wrong-way driving. Wrong Way Warning is essential in preventing driving accidents that claim an average of 360 lives each year on United States roadways. Wrong way driving often leads to the most feared of traffic incidents, the head-on collision. These collisions are more likely to produce serious injuries and fatalities. Most of the time the offenders are confused, distracted or intoxicated drivers, so one might think there’s little that can be done to prevent wrong way driving. Installing DO NOT ENTER and WRONG WAY BlinkerSign® LED signs can deter drivers from making wrong-way movements onto freeways and other restricted roads by providing extra visible warning cues standard traffic signs lack. Optional activations include vehicle direction sensors (radar speed detection and induction ground loops). Additional signs facing the opposite direction can be added to warn drivers of the wrong way traveling vehicle.